This morning over breakfast I read an article about “effective altruism,” a new movement among young adults to be strategic as well as passionate in their philanthropy. They advocate looking at the “hard numbers” to decide where their gifts of their time, talent, and treasure will be most effective. Not everything is so easily measured in numbers, but in this spirit, and with great excitement, I am writing to share with you the early “returns” on your investment in CORE. With your help, we have made great strides in the past year to pilot and refine our groundbreaking new approach to community change-making. We’re off and running! Earlier this year we held the inaugural round of our matchmaking and matching grant program. 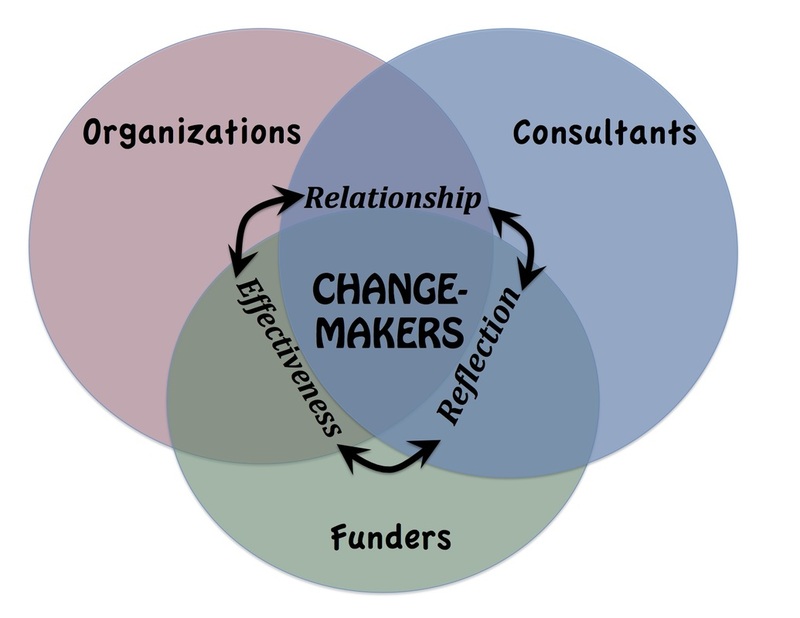 Through this process, we assist social change organizations in their quest to find consultants (think “personal trainer”) as they build their capacity (think “core strength) to be more effective, sustainable, and joyful in meeting their missions. The key to more successful matches is our “Learning Conversation,” an exploratory discussion held with each organization and consultant applicant. 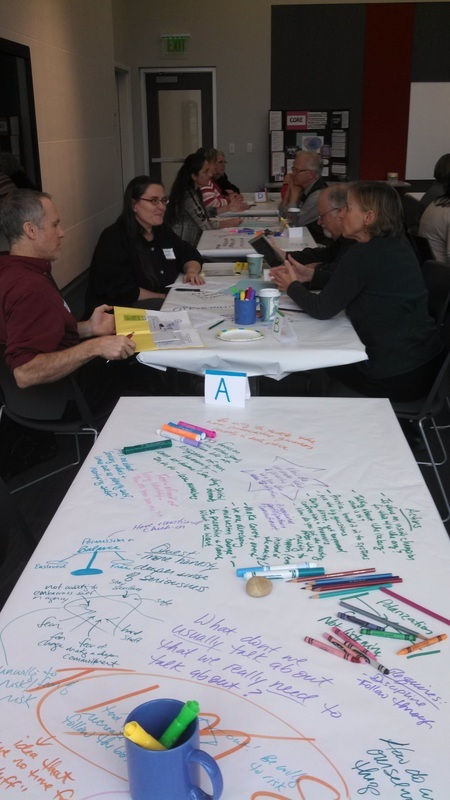 Conducted by a 2-person team of trained volunteer community members called “Connectors,” the conversation is an opportunity for organizational applicants to reflect on what would be most useful to them, and for consultant applicants to reflect on where and how they do their best work. Some numbers: 16 Connectors were introduced to each other and to the work of 17 consultants and 8 organizations, including participating in 3 in-depth Learning Conversations each. Expand their list of trusted sources of help and collaboration. In many ways, this first process far exceeded our expectations. In particular, we’ve been told being a Connector is a fun, fascinating, and fabulous professional development experience, even for people very experienced in the non-profit sector. The Connectors came together in a unique, facilitated process to share what they’d learned and discern the best 2-3 consultants for each organization. All 8 organizations received these recommendations. Being a CORE Connector was an excellent professional development opportunity for me. I learned about local consultants' areas of expertise, how their particular talents might match nonprofits' needs, and how the successful matching of consultants with nonprofits can enhance our social change efforts. With help from our generous donors we were able to provide matching grants to three of the organizations, totaling $10,500, to hire the consultant of their choice. Click here to see photos from one of the Community-Wide meetings on the arts and creativity facilitated with the help of this CORE grant. A third group was able to strategically combine CORE’s support and one of our recommended consultants with other relationships and resources to create a new, comprehensive communications campaign. The process and its results, “Citizen Voices Matter,” have significantly increased the organization’s capacity to provide timely and engaging communication about important environmental issues. Click here to see the results for yourself, and hear the inspiring stories of citizens fighting to protect our land and water. Thank you very much for helping make all of this happen through your generous financial support/financial support and gift of time and expertise/gift of time and expertise. Beginning to create an “enduring portfolio” of consultants, so they don’t need to reapply each round. We’re expanding. As a direct result of the first round, many more people are becoming involved with CORE. With this increased capacity, we have powerful volunteer leadership involved in our governance and outreach processes. We also are able to return to hosting regular monthly Consultants’ Circles designed to provide opportunities for relationship-building and reflection among those providing capacity-building support to community-benefit organizations. We’re also discovering new ways of providing “consulting for organizational reflection and effectiveness” to organizations. With our new “Taste of CORE” sessions, we are creating opportunities for community leaders to get support from each other as well as from consultants and Connectors, to move forward more effectively, sustainably, and joyfully towards their visions. Funders are a key ingredient in the CORE recipe. We are reaching out to area foundations to explore whether CORE’s model might be a good fit for their own efforts to support capacity building among their grantees. And, with your help, the individual donations of time, talent, and treasure necessary to make all of this possible will also continue to grow. Please consider making a year-end, tax-deductible gift to CORE. Your financial support allows us to train Connectors, expand our matching grants, and reach out to more community organizations - all to create lasting social change. We also encourage you to consider volunteering with CORE. Our aim is to have volunteers get as much out of their activities as we do, so please contact me today to find out if we can make that happen for you. See our CORE Builders' Circle page for suggested gift levels and what each level could "purchase," although gifts of any amount are very welcome. Click here to make a contribution online, or send us a check made out to C4CS/CORE, 354 W. Main St., Madison, WI 53703. During this season of Thanks-Giving, I want to say, with all of my heart, THANK YOU for your past and future support! !